These posts may appear irregularly, for awhile; that is due, mainly, to the large amount of material that needs to be read, digested, correlated, counted (the mind has a metrical basis) and such. Thomas was an early arriver (1623/24); then, the tree for his direct descendant that I'm working on has several hundred New England families in it that were here before 1650. That means that these families have many generations here, too. Fortunately, a lot of these families have researched their history both here and on the other side of the pond. For Thomas' past, before his arrival (which we'll get to), I am going to consider that James Savage was the most insightful as his family originates from the area that he proposed for Thomas. In fact, some of the trees associated with the Gardner one that I'm working have a Savage somewhere in the line. We will have posts looking backward, hopefully for Margaret, too. In total in the above-mentioned tree, there are almost 100 families claiming royal descent (Ole's blog, example), some of these are on the NEHGS list. The interplay of the plebian and the aristocratic will be a story that we will have to feature from time to time. One modern analyst made the claim that a source for recent problems can be attributed to aristocratic notions being maintained in England and being brought over here by some. As mentioned before, Thomas, and his life, can be the foundation for very good discussions that may have a lot to add to understanding the current quandary brought on, for the most part, by those considered to be the 'best and brightest' (give us a break). Now, to consider this side of paradise, let's go forward from Thomas. Like the Mayflower group, with their list for three generations, we'll start with Thomas' kids and carry this forward a couple of notches as a means to identify gaps. In the below list, we'll start first with information from Dr Frank's book about spouses and children. There may be pointers to work done already, for some, but only as an example (meaning, of course, to be verified). Also, the pointer may be only to partial information. At some point, the goal is to pull this data together, hopefully with a full tree that includes both genders' offspring. That is, for each generation, fill in the information for all siblings, to the extent possible, of course. Note: The links for Thomas' grandkids below (bold and larger font) came from the work of Kathleen Hall Boyce who spent 2010 looking at the Gardners. Samuel - m. 1st Mary White (Mary, Eliza, Mary, Margaret, Samuel, George, Jonathan, Hannah, Abel), 2nd Elizabeth Paine -- This is the descendant tree that I'm following. rootsweb.com is interesting. Here is a descendants chart for Samuel and a pedigree chart for Abel, his son. Some pedigree charts are a little more extensive (to be checked edited 04/16/2012). 12/07/2018 -- Dr. Frank and WikiTree. Using his hand-written notes, we filled in his mother's line this past summer. Too, we are going to focus on filling in the gaps. 10/25/2018 -- We have a new look: TGSoc.org. And, we are using WikiTree (example of Samuel/Abel) with the goal of getting the first five generations documented. Some of these links may be stale (will be checking). 02/01/2013 -- Update rootsweb link to Larson tree. 04/16/2012 -- Changed link, Samuel. When these databases get updated, pointers change. So, we really need to have a query-based approach. In the meantime, go to 'Index' and enter the name. In this case, it was "Gardner, Thomas" which then brings up the right person. The graph is via Pedigree. 08/29/2011 -- A little more about Miriam. 03/17/2011 -- Another descendants list (Langsdorf, et al) for Sarah. 01/09/2011 -- We'll have posts related to the madness of 1692. 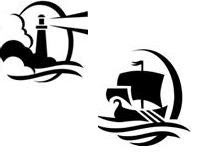 12/20/2010 -- For Ruth, daughter of George, see post on the Hathorne connection. 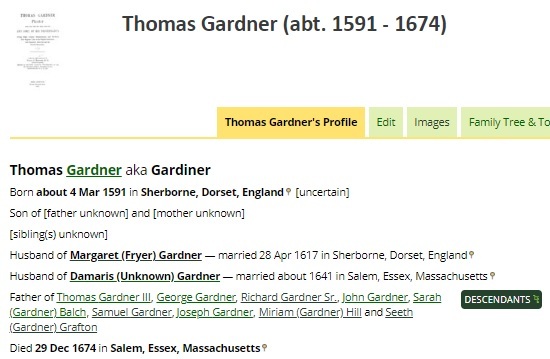 11/28/2010 -- The pedigree for Thomas Gardner (Salem) at the Boyce site changed. So, the link has been removed. Since databases at rootsweb are updated regularly, pages can change. Hence, the procedure might be to do an image capture of the tree, or a portion, with a link to the current tree. That, folks, is one maintenance item that will be required for web-based approaches. This is a type of degradation. Another item removed today was a pointer that was to a local file rather than to a web-based file. 11/10/2010 -- Ole Larson is back. His genealogy site. 10/31/2010 -- About cousin calculations. 10/31/2010 -- For RD example, switched from the excellent example of Ole Larson (his blog has disappeared -- evidently he died in August, 2010) to the blog of the Slovak Yankee, for now. 10/29/2010 -- Another thing to look at will be the famous cousin game as it seems to be ubiquitously present; that is, it is found seemingly everywhere that there is a genealogical site. We have already started a list of Thomas' descendants which can be extended as we learn more. Cousins can be extracted from that list. As well, interplays between all of the families brings in another set. So far, I've identified relationships in the tree with 27 of the Presidents of the USA. Then, the list of luminaries is large, many in the arts and sciences. Of course, attainment in some religious sense is represented, too. Then, we have that for which Salem is famous. Needless to say, and given that Thomas was in Salem early, we'll need to look at the mania of 1692 which, by the way, is apropos to the topic of two generations. We've already shown that [Nathaniel, offspring of] John Hathorne (the main judge) was a descendant of Thomas. And, many of Thomas' descendants have a number of those involved in the Salem area troubles as grands (parents, aunts, and uncles) in their tree.